The Galicia Nueva Castle Hotel wellness centre, through its architecture and furnishing, affords an atmosphere of genuine antique baths. The pleasing earthy colours of the mosaic, impressively decorated Corinthian columns and images of ancient gods provide our guests undisturbed rest and relaxation in this unique environment. The wellness facility offers a recreational pool, whirlpool, dry sauna, steam sauna, relaxation room as well as fitness area. 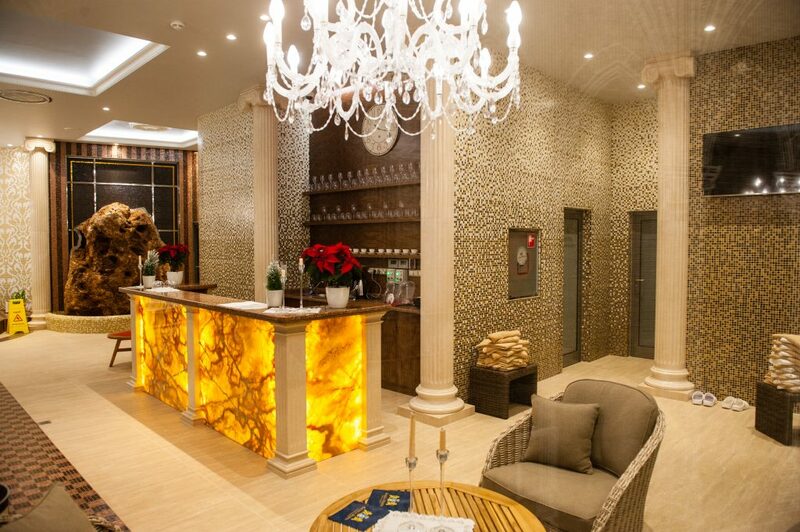 Guests can choose from a wide range of massages and refreshments of drinks at the bar. 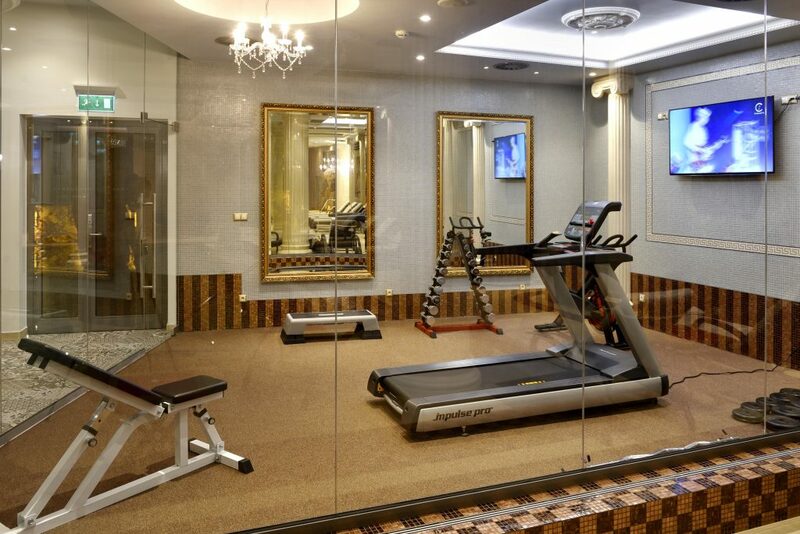 The wellness and fitness area and the range of body care services are exclusively for hotel guests. The pleasant environment of the dry sauna is ideal for savouring the perfect Swedish type sauna procedure, based on its minimum humidity and temperatures ranging between 100 and 110°C. 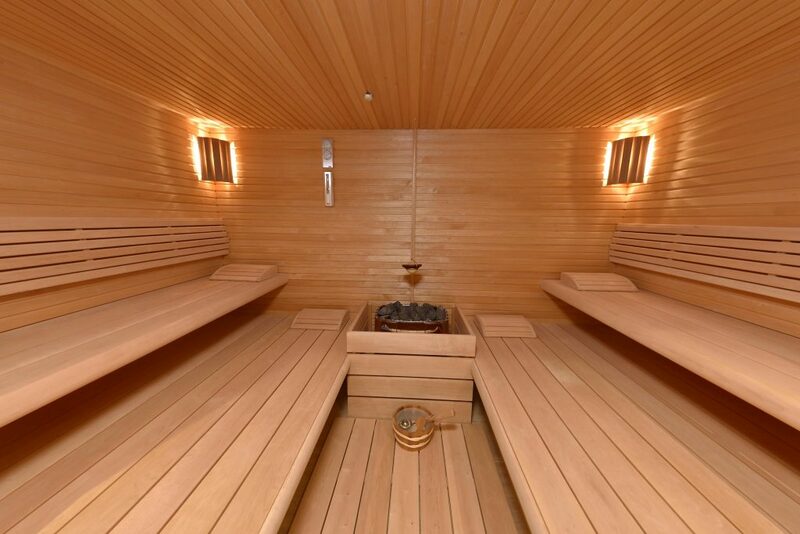 The dry sauna interior is lined with the correctly dried high-quality alder wood. The sauna’s benches and other furnishing are made of heat-treated aspen wood providing durability and low thermal conductivity, thus preventing any burns on the benches and making them pleasantly warm with a smooth surface. Four lying or up to twelve sitting guests can enjoy the sauna at the same time. Back in ancient Rome and Greece steam baths were be a favourite way of getting rest. Thanks to special generators, water in the sauna is turned into steam, ensuring high and almost 100% air humidity. For its pleasantly warm temperature ranging from 45 to 55°C, this type of sauna is the favourite, with the lowest burden on the body. 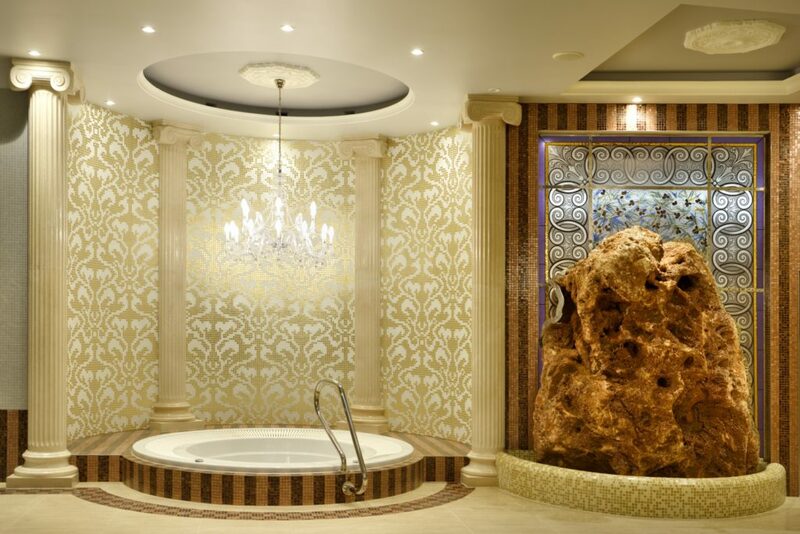 The atmosphere of impressive ancient baths is complete with its travertine floors and their interesting combination of dark bronze and pearl coloured mosaic with stone niches of pointed arches. 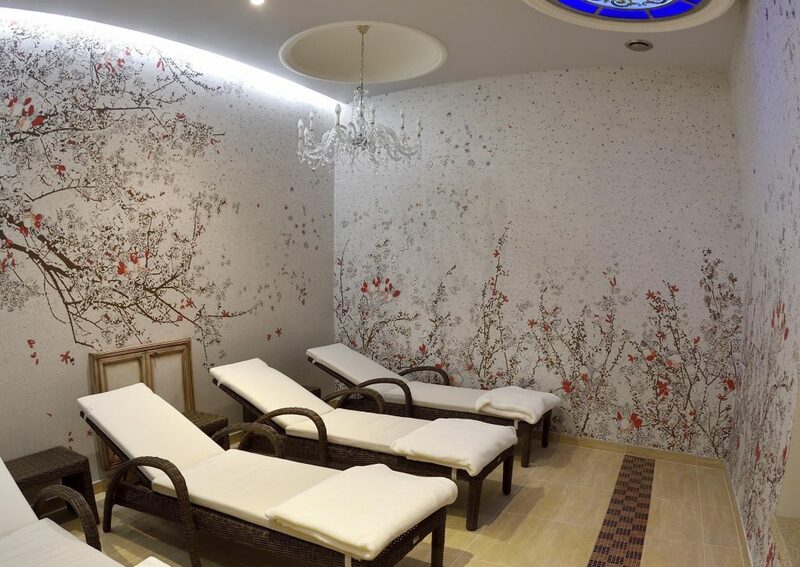 The grandeur of the steam sauna is underlined by the lighting of the starry sky in harmony with the golden mosaic bird’s eye picture being a symbol of the soul’s mirror, as the sauna is an excellent means to both physical and mental relaxation. 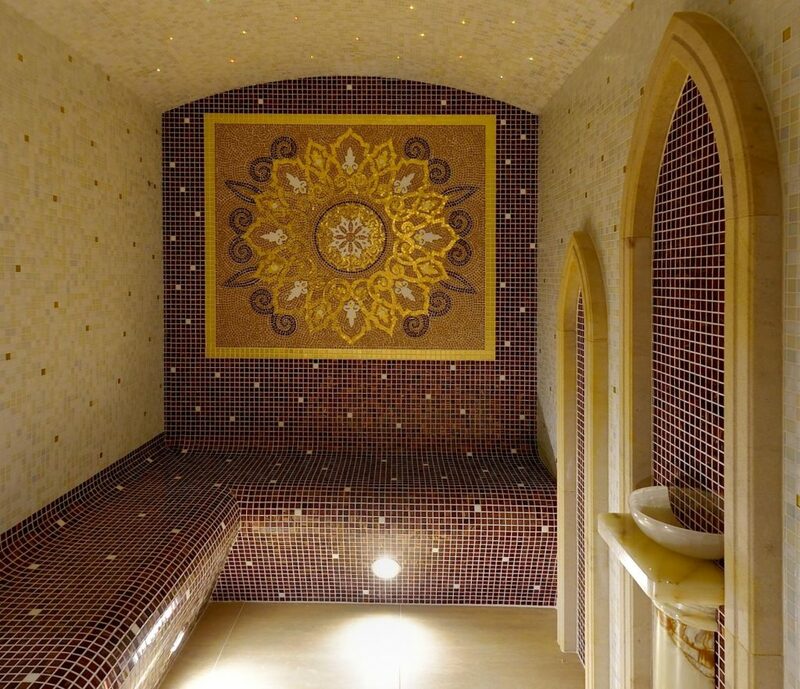 A round whirlpool tub is located in the vaulted architectural niche with a romantic golden and white mosaic. 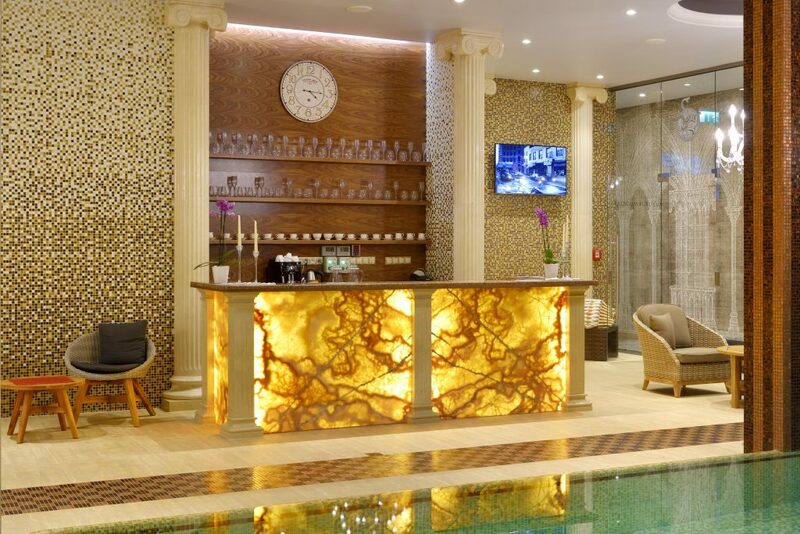 The feeling of pleasant relaxation in a genuine ancient spa is emphasised by the surrounding Ionic pilasters with their typical plinths and by crystal chandelier hanging right above the whirlpool. The 34°C water suppresses pain in muscles and joints and massage jets have a beneficial effect on blood circulation. Relaxation in the whirlpool will bring you general release from physical and mental stress and the tension of hectic life. 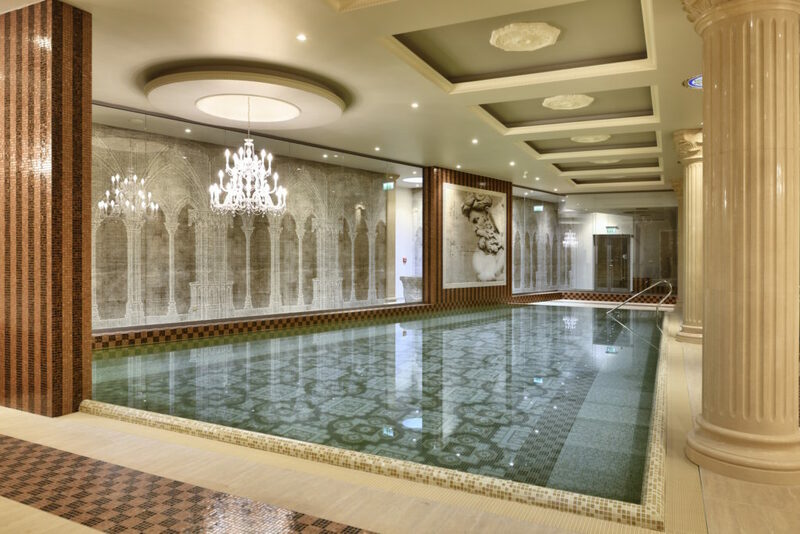 The jewel of the wellness facility is its recreational pool 12 metres long and 1.3 metres deep. 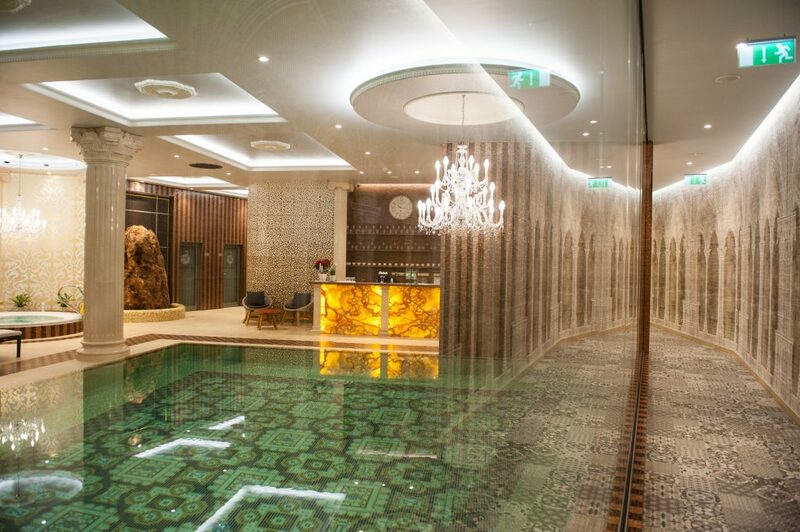 The interplay of a healthy mosaic colours and crystal lighting add a tinge of emerald green to the water’s surface. The pool’s layout plan copies the outline of the interesting trapezoid shape, the longest side of which is bordered by a glass wall of the adjacent corridor leading to the wine bar. The guests relaxing in the pool are overlooked from a golden mosaic frame by the ruler of all seas, the ancient Greek god Poseidon. 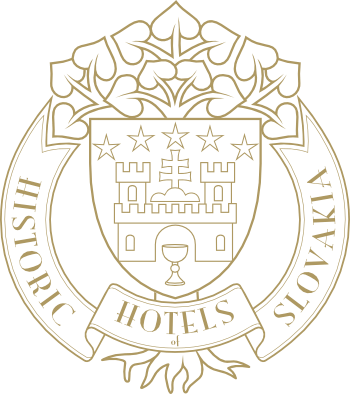 Hotel guests may enjoy undisturbed relaxation here, in the pleasant surroundings of blooming flowers which, together with the Ionic pilasters, create an image of a peaceful antique garden. Four comfortable chairs with adjustable backrests guarantee you rest in a discreet environment. Your comfort will be accompanied by light tones of esoteric music and unobtrusive dim lighting penetrating through the stained-glass skylight. The healing effect of the conscious and effective contact of an expert on the human body has been well-known since the times of ancient civilisations. It is in an environment breathing with history where you can put yourself into the hands of a professional and choose one of the many types of massage. The pleasant atmosphere is created by the calming effect of water running along massive dolomitic limestone and by light seeping through the stained-glass wall. 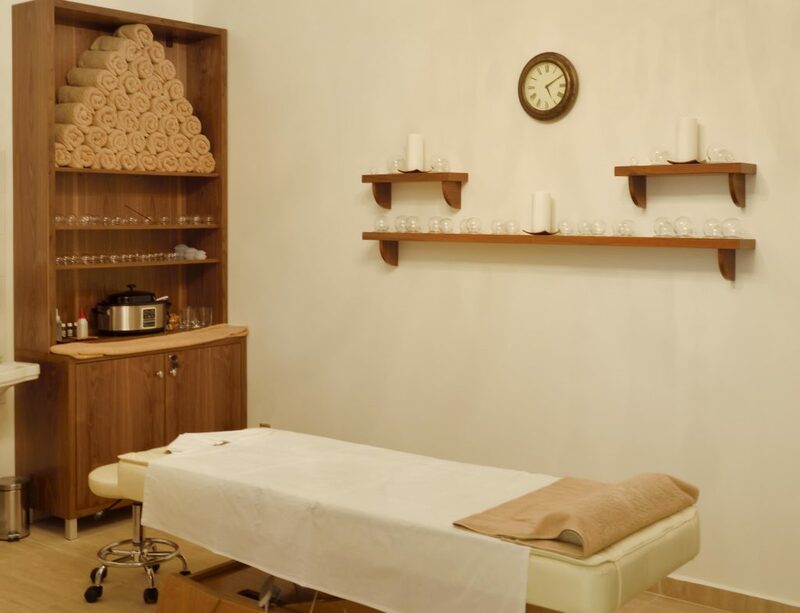 In order to achieve the best desired healing and relaxing effect possible, you may wish to consult the choice of suitable types of massage with our helpful professionals. Active movement is very important for health in general, since it improves the activity of the cardiovascular system and also encourages the production of endorphins which enhance immunity. The fitness area contains a stationary bike, treadmill, multifunctional bench and step for leg workouts and dumbbell bars. 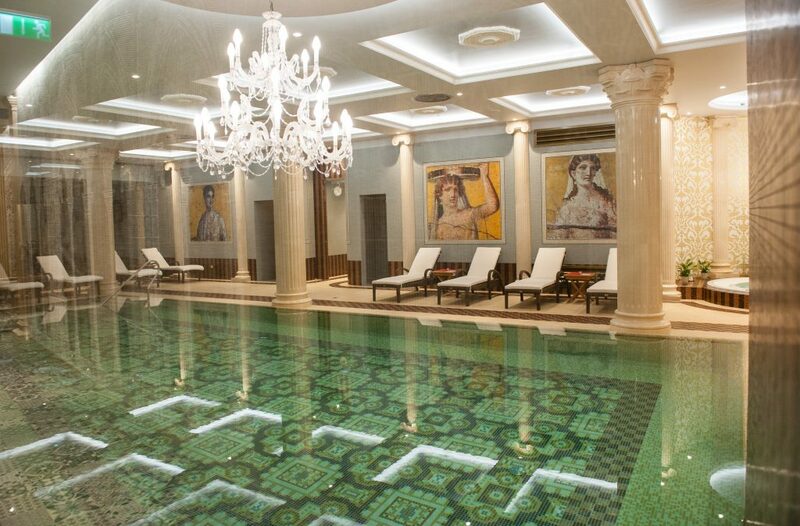 The experience of movement in this unique environment is emphasised by massive mirrors in their golden frames, antique pilasters coming out of the mosaic wall and an impressive view of the wellness centre designed in the antique style. The wellness bar offers a choice of drinks and comfortable chairs in which you can fully enjoy the soothing tones of esoteric music. 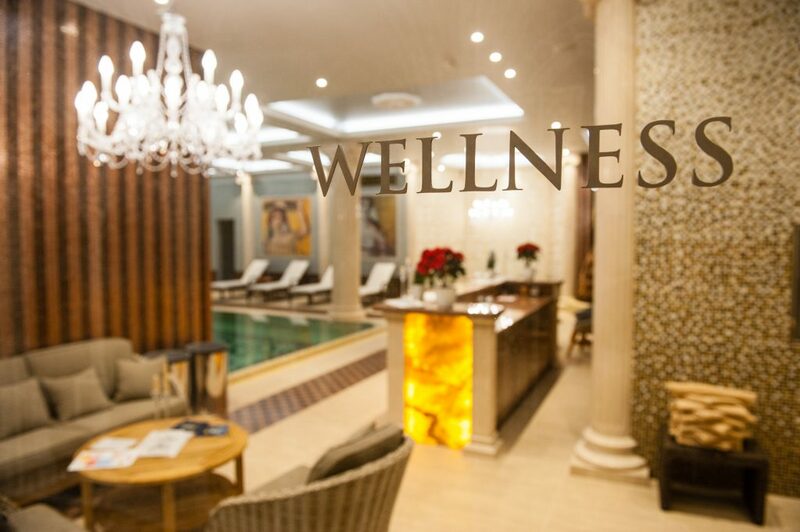 The wellness centre is open for hotel guests daily from 8:00 to 22:00. If you forgot to pack your bathing suits, please contact the hotel reception where you can buy women’s, men’s or children’s swimwear.